In a field full of wildflowers, a boy and a girl stood side by side beneath an ancient oak tree. The sky was angry, the thunder growling like an angry beast. Then he stood in front of the fireplace and blew the candle out. It exhaled like a sleeping giant and pushed a breeze through the cottage that rattled the windowpanes. Fionn felt it on his ankles as he sank into his grandfather's chair. Fionn Boyle comes from a long line of brave seafarers, people with the ocean behind their eyes. But he can't help but fear the open sea. For years, Fionn's mother has told him stories of Arranmore Island, a strange place that seems to haunt her. Fionn has always wondered about this mysterious island, and from the day he arrives he starts noticing things that can't be explained. He can sense the island all around him, and it feels like the island is watching him, too. I've been curious about this one. I don't read a lot of middle grade works, but I might have to take a closer look at this one. Thanks for the share! Sounds like a fun read. Thanks for visiting my blog. 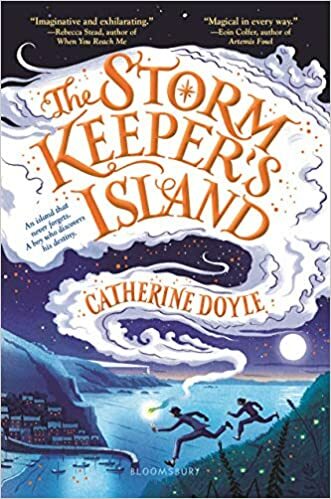 The Storm Keeper's Island sounds interesting. I also love the look of the cover. Love that eye catching cover! I'm not really a Middle Grade reader, but it sounds fun. Hope you enjoy it. Sounds like something I'd absolutely love! I like a good, fun MG read. Happy weekend!